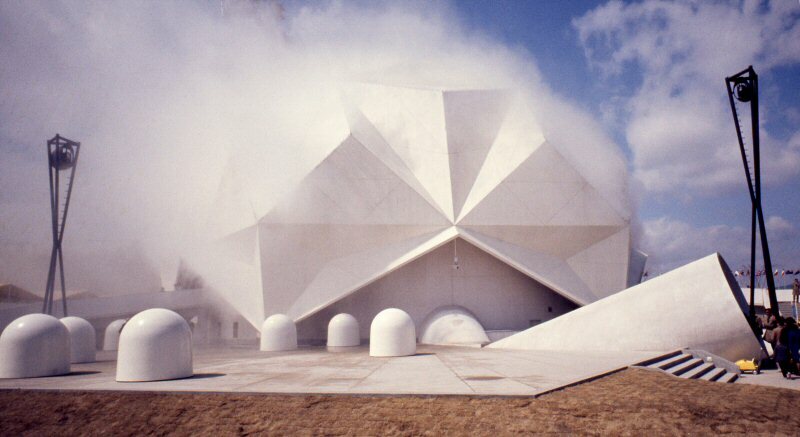 Pepsi-Cola Pavilion, (Osaka, Japan), 1970. 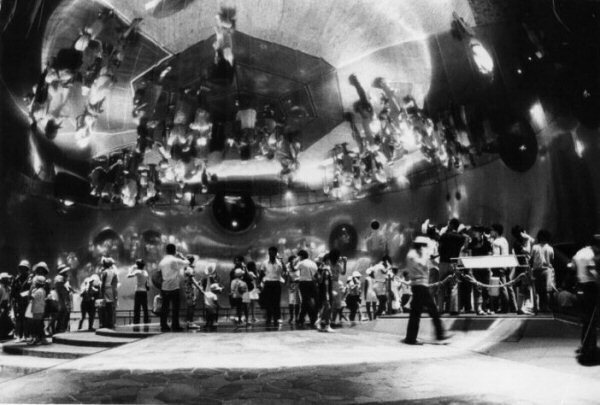 The interior of the Pavilion was a 90 foot diameter 210 degree spherical mirror made of aluminized mylar. The mirror created real images of the visitors, which hung in space above their heads. The floor was made of different materials and sounds associated with each section of the floor could be heard in handsets carried by the visitors. Japanese and American artists were invited to program the sound and visual elements of the Pavilion. In 1968, David Thomas at Pepsi-Cola teamed up with E.A.T. for a project that enlisted European, Japanese and American artists to help design the American pavilion for the Osaka World's Fair set for 1970. The project's coordinators, Robert Breer and Billy Klüver, asked the artists Forrest Myers, Robert Whitman and David Tudor to design different parts of the building's infrastructure. The architect John Pearce drew up the plans, and 63 engineers and scientists helped to set up technological devices on the outside and inside of the pavilion. Artists invited to the fair, including several E.A.T. members, presented performances that showcased the site's acoustic potential and architectural features.